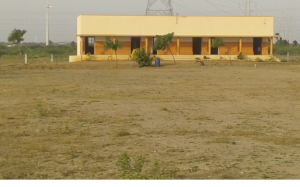 Current School – This school is located in South Indian State of Tamil Nadu; and classes are from Lower Kindergarten to 3rd grade, with 130 students in 3 rooms. Living conditions – The Dalits live in crude huts they build by themselves using broken bricks, mud and straw with roofs made of coconut leaves. Often families use discarded plastic sheets to cover their straw roofs which keep some of the water from getting into their homes. Sanitation – is extremely low. There are no toilets or sewage system. Health – Diseases are rampant in the village. There are no health facilities within five kilometers of the village. People must travel eight kilometers to get basic medical attention at a health clinic. Poverty and discrimination have condemned DALIT CHILDREN to life of misery and suffering. Join with us to break this cycle of despair by doubling the size of the school.